Along with a few other food bloggers, Mövenpick recently set me a challenge which was to create an Ice Cream Sundae using Mövenpick ice cream and I could add any additional non-ice cream ingredients I fancied. But I had another challenge of my own, which was to try to take photographs before it melted! 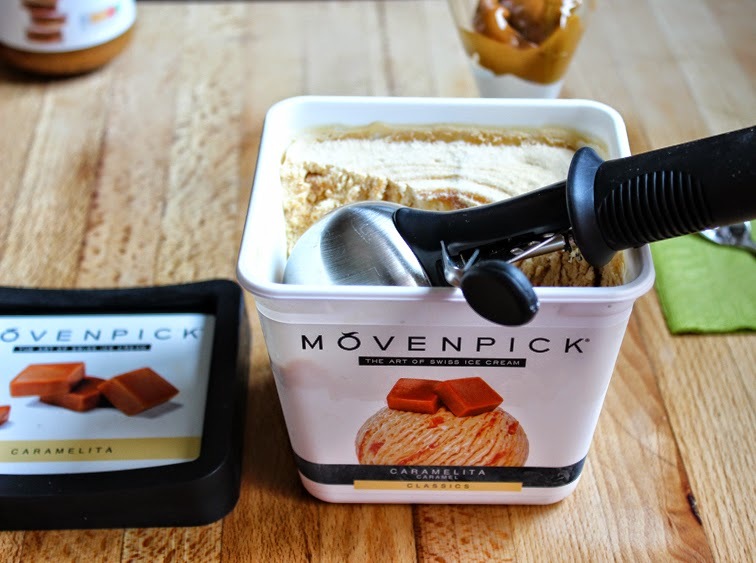 With that said, this Sundae made with Mövenpick Caramelita ice cream makes for perfect eating with the lovely hot weather we're currently enjoying here in the UK. Mövenpick Ice Cream is a luxury Swiss ice cream that doesn't contain any artificial additives or colours and tastes truly delicious. It can be purchased at Ocado and besides Caramelita it is available in many other flavours. Please note this amount makes far more than enough for two Sundaes but it's so moreish there's no need to fuss as it will soon be eaten! Put all of the above ingredients into a large frying pan and stir continuously over a low to medium heat for about 15 minutes - don't let the sugar start to caramelise at this stage. Now turn the heat up to medium high and stir occasionally so that the peanuts are well coated and the sugars does start to caramelise. As the water evaporates you will need to stir so the peanuts don't burn. Cook until the water has gone and the sugar has coated the peanuts. Once done tip and spread in a single later onto a baking sheet covered with greaseproof paper and allow to cool completely. To assemble the Ice Cream Sundaes start with by adding a spoonful of Dulce de Leche to your glasses followed by a scoop of ice cream and some whipped Mascarpone. Layer with more ice cream, mascarpone and Dulce de Leche. Top with a few caramelised peanuts. Get your long spoons out and tuck in! Please note this amount of caramelised peanuts will make far more than enough for two Sundaes but it's so moreish there's no need to fuss as it will soon be eaten! Put the Mascarpone, double cream and a teaspoon of sugar into a bowl and whisk with an electric whisk until thickened. 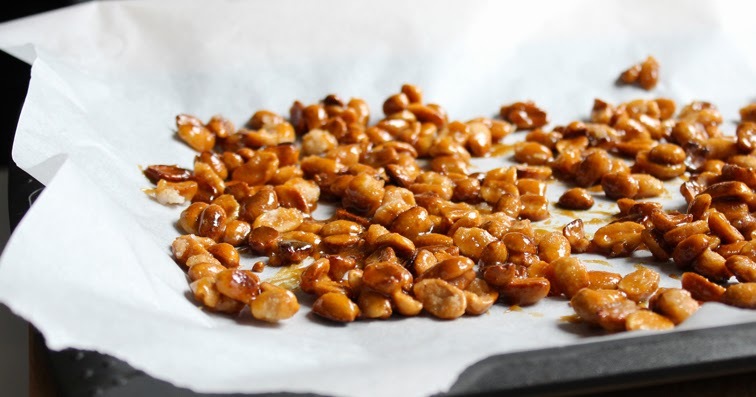 Put the peanuts, caster sugar and water into a large frying pan and stir continuously over a low to medium heat for about 15 minutes - don't let the sugar start to caramelise at this stage. Now turn the heat up to medium high and stir occasionally so that the peanuts are well coated and the sugars does start to caramelise. Start with by adding a spoonful of Dulce de Leche to your glasses followed by a scoop of ice cream and some whipped Mascarpone. Layer with more ice cream, mascarpone and Dulce de Leche. Top with a few caramelised peanuts. Get your long spoons out and tuck in! 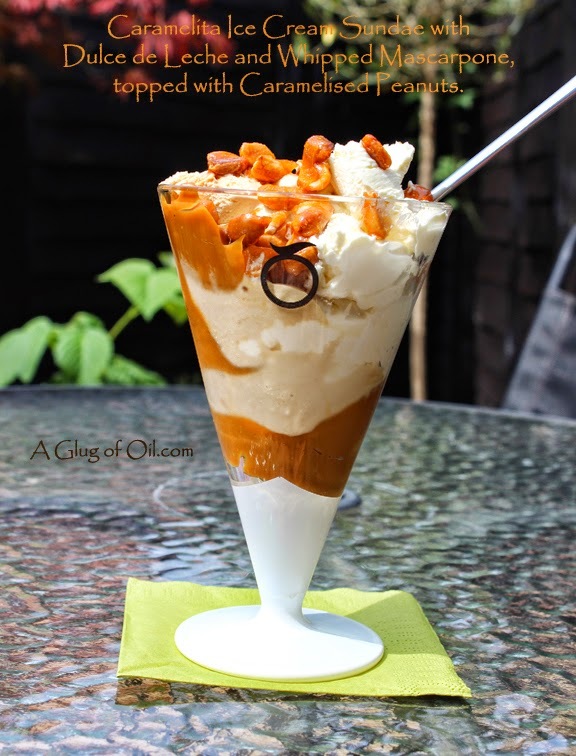 Disclaimer: I was asked to create an Ice Cream Sundae using Mövenpick Ice-Cream and I was provided with Ocado vouchers to purchase the ingredients to test my recipe before posting. The prize for the winning sundae is master class with The Langham’s head pastry chef, followed by afternoon tea for two at the Palm Court hotel in London. Update: I actually won the competition!! Gosh that looks tempting. I'm trying to focus on more veggies and less sugar at the mo but this might be worth breaking my own rules for. That looks amazing!! The caramel and nuts...it's a lovely combo and it seriously looks so appetizing. I wish I could have it now. Very creative. Lovely pic too - you beat the heat.